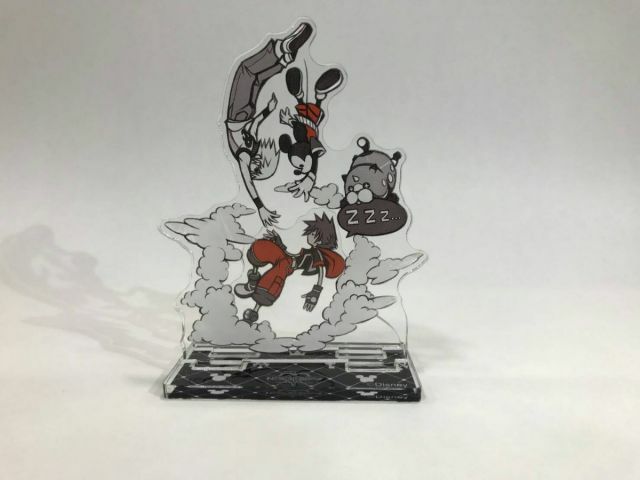 Beginning March 9th, Square Enix is hosting a giveaway of one of three Kingdom Hearts acrylic stands for people who have Square Enix memberships. You can view the giveaway site here. Applicants must enter the serial codes and point cards found with their copies of Kingdom Hearts HD 1.5 + 2.5 ReMIX and Kingdom Hearts HD 2.8 Final Chapter Prologue (presumably copies from the Japanese Square Enix e-store) for a chance at winning one of the stands, drawn by Tetsuya Nomura. The deadline for entries is March 22nd (up until 23:59 Japan time). A picture of the stands can be seen below, these stands were also given away during the release of Kingdom Hearts HD 2.8 Final Chapter Prologue. Application will only be made once per account with serial code registered. Multiple serial codes of the same product can not be registered. The download version will be excluded from the campaign. Once you have applied, you can not change the type of acrylic stand you wish. After a strict drawing, we will send you "winning announcement" e-mail to the winner at a later date. Those who are elected will be required to enter the winning prize delivery address from the URL described in the mail. * If there is no shipping destination input within the period specified by e-mail, winning will be invalid. Thank you for showing this to us, Master Kenpachi! Wow, so it seems that now there's a chance to win a Kingdom Hearts acrylic stand, eh? They all look beautiful, so whoever wins and get to receive one of these is one lucky guy/gal! 19 What are your impressions on Joker in Super Smash Bros. Ultimate?